SKU: 4012927641415 Categories: Trading Card Games, Yu-Gi-Oh! Didn’t get enough of Flames of Destruction? 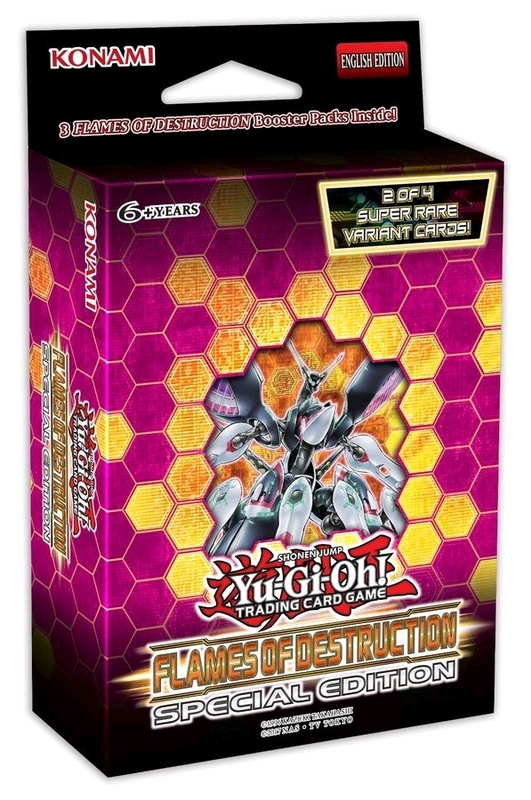 Well each box of Flames of Destruction Special Edition includes 3 booster packs of Flames of Destruction, along with 1 of 2 Super Rare variants of sought-after cards as well as 1 of 2 Super Rare variant preview cards from the upcoming Summer 2018 booster set! Flames of Destruction shakes things up with new cards for established Deck themes, a brand-new Link Monster theme that can be played as its own Deck or spliced into existing strategies, the return of the Elemental Lords, and more! These new Link Monsters have flexible Link Materials that let you use them in any Deck, and each one has two abilities: one that you use when you Link Summon the monster and one that’s always active. These powers range from retrieving any Spell or Trap Card from your Graveyard to changing the number of cards you get to draw each turn. With some strategic card placement, you could be drawing up to 6 cards at the start of your turn instead of just 1! To make the most of these abilities, you’ll want to keep your Link Monsters co-linked. If you do, you’ll get a refund on the cost of the new monsters’ one-shot abilities and their always-on powers will grow much stronger! Try combining these monsters with cards like Tri-Gate Wizard from Structure Deck: Cyberse Link or Firewall Dragon from Code of the Duelist to gain even more from co-linking your monsters. For over 5 years, the four Elemental Lords have stood alone as keepers of some of the strongest effects allowed in Dueling. In Flames of Destruction, the fifth Elemental Lord finally arrives, along with the monsters tasked to guard their great powers from those who would misuse them! The newest Elemental Lord can only be Summoned while you have exactly 5 LIGHT monsters in your Graveyard and commands the power of Raigeki the power to destroy all enemy monsters at once! This Elemental Lord is a great fit in Decks built using the LIGHT monsters from Structure Deck: Wave of Light. On top of all that, Flames of Destruction is full of cards that are useful in any Deck and cards that elevate popular themes to new heights! You could find… Powerful Trap Cards you can activate from your hand. A new “Trap Hole” that banishes monsters face down. A Spell that revives one of your monsters in a Zone a Link Monster is pointing to. A new “Topologic” Link Monster that banishes all Spells and Traps on the field when a monster is Special Summoned to a Zone it points to. A Dragon that can erase all the cards in a single column and then render that column unusable. A “Trickstar” soloist that shrugs off activated card effects and inflicts big damage every turn. Flames of Destruction unleashes the full power of the elements with the new “Elementsaber” monsters, a new monster theme that works with the existing “Elemental Lord” monsters. To celebrate this release and give players a second chance to get the older (and sometimes hard to find) Elemental Lords, each Flames of Destruction Special Edition box comes with 1 of 2 Elemental Lord monsters, either Moulinglacia the Elemental Lord or Grandsoil the Elemental Lord. Moulinglacia, the Elemental Lord of Water, was first released in 2012’s Abyss Rising booster and has never been reprinted, until now. Grandsoil, the Elemental Lord of Earth, after first appearing in 2012’s Return of the Duelist, was toppled from his throne and is currently not legal for play, due to his incredibly high power level, but will be receiving revised card text and restored to tournament legal status with this release. Each Flames of Destruction contains: 3 Flames of Destruction booster packs, either Moulinglacia the Elemental Lord or Grandsoil the Elemental Lord, and World Legacy’s Memory or Universal Adapter from Cybernetic Horizon.